Almost all websites have forms. Whether you are a B2B/Lead generation site, an eCommerce site, a travel site, etc… you most likely have forms. More importantly, you have people who don’t fill out your forms correctly and get some sort of error message. While error messages are a fact of life, in the web analytics/optimization world these are painful since you work so hard to get people to your site, to read your content and then agree to give you personal information. That is a lot of time and money spent only to have someone potentially abandon because they have problems with your forms. This represents your “low hanging fruit” so to speak – people who have already decided they like you and want to give you their information! In this series of posts, I am going to share some techniques for seeing how much of a problem your website has with form errors and in the next few posts I will cover some more advanced things you can do to diagnose these form error issues. Which Fields Produce the Most Errors? The first step in diagnosing form error issues is understanding which form fields are causing issues. Unfortunately, since a user might receive more than one error message, you have to pass in multiple values to a SiteCatalyst variable. This can be done using the Products variable, but since that is often already being used for more important purposes, I will suggest that you use a List Traffic Variable (sProp) to capture these values. Unfortunately, List sProps are not well documented and have some specific limitations (see Knowledge Base ID# 2305). All you need to know is that List sProps allow you to pass in delimited values and when you view them in the sProp report, these values will be split out. Let’s look at an example. 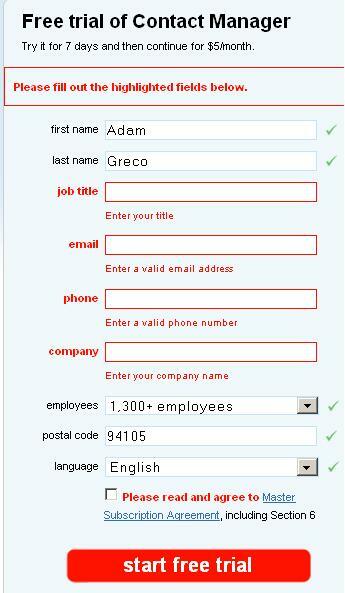 Here we see a form in which a user has attempted to submit the form without filling out some required fields. What we want to do is capture which fields this user messed up (could mean incorrect value or leaving blank) so we can see which ones are messed up the most often. In this case, we see that the form errors are related to Job Title, E-mail Address, Phone #, Company Name and the MSA checkbox. 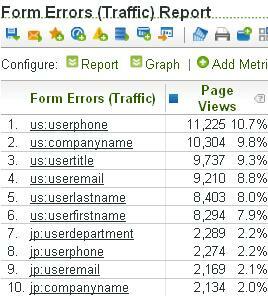 In this case, we can see that we are getting the greatest number of errors on the Phone Number form field on the US website (I have added the site since forms exist in multiple sites). I could also filter this sProp report for just US or Japan form fields by using a text search of “us:” or “jp:” as needed. This report should help steer you in the right direction when it comes to fixing basic form field issues. If you don’t have access to Discover and seeing this type of breakdown is important to you, you may want to consider using the Products variable instead of a List sProp since the Products variable comes with full Subrelations by default (though this implementation will be significantly more difficult). I will also be covering a different way to approach this in my next post so stay tuned! If you are not currently tracking form field errors, hopefully this will give you some ideas on how you can start the process of seeing where you are tripping up your visitors. Keep in mind that this post is just a start and that the next few posts will go into more advanced stuff you can do and how you can identify your biggest opportunities for improving conversion. Adam, I’m so curious, how would you use the products variable for a form? This is the first time I’ve seen anyone else discussing these issues and ways to collect and analyze the data. Since June 2010 I’ve been working on Tripwire (http://www.tripwireapp.com), which intends to reveal UX issues by tracking a web application’s form validation errors. Right now we’re in a closed alpha and limited to Ruby on Rails apps, with a very simple setup process.